The comic duo composed of a fat and thin character is a common trope in Western cinema, and has been for a long time. The thin character is usually smart and quick-tempered; the fat character tends to be meek and simple-minded (either unintelligent, naive, or both), but also tends to be the source of humor, whether through a savant sense for one-liners, propensity for pratfalls, or outlandish eccentricities. One of the most famous and most illustrative pairs of this kind is Abbott and Costello, who started out as a Vaudeville act and went on to star in more than 30 films together. 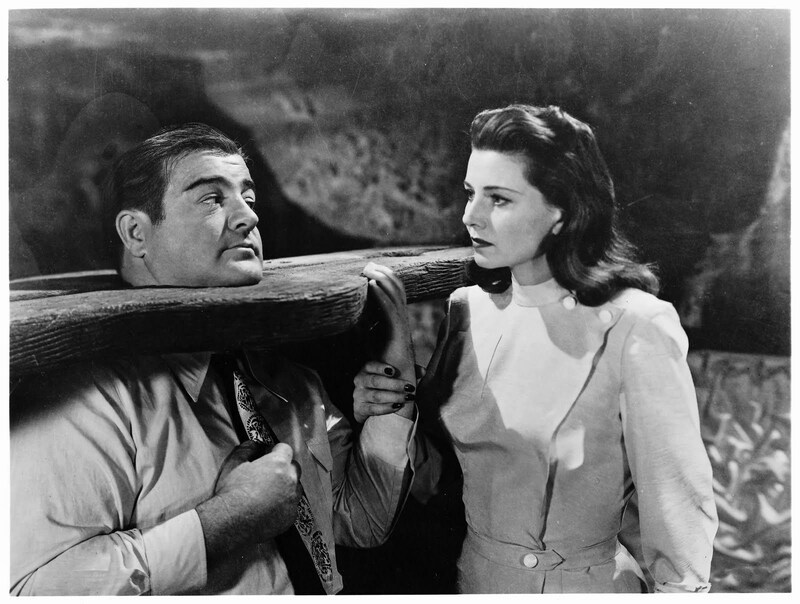 Several of their films are horror-comedy, the first of which is Abbott & Costello Meet Frankenstein, putting the hapless duo in a story filled with supernatural threats. Most of the fun comes from seeing them in way over their heads, coming to the realization that something is up and trying to figure out what’s going on. 62 years later, the same basic dynamic of two disparately-sized Joe Six Packs inadvertently stumbling into a horror film scenario plays out in Tucker & Dale Versus Evil. Although both horror and comedy have changed enough in the intervening years to make some significant differences in the dynamic between the characters, there’s also a lot that hasn’t changed for respective fat guys Wilbur Gray (Lou Costello) and Dale Dobson (Tyler Labine). The dynamic between the two friends at the center of each movie is very similar. Chick Young (Bud Abbott) and Tucker– the thin friends– are both more practical and strong-willed than Wilbur or Dale, and often take the role of leader. Both Dale and Wilbur are more passive, but the films interpret that in different ways. Dale’s lack of assertiveness is due to an “inferiority complex,” as Tucker describes it: if Dale gains confidence, then he will be able to stand up for himself and flirt with women. Tucker acts like an older brother to Dale, giving him advice and emotional support when he feels bad about himself, such as his initial failure to talk to beautiful college student Allison (Katrina Bowden). Dale privileges Tucker over his own interests, such as pretending to like fishing because it allows him to spend time with his friend. Wilbur’s weakness, on the other hand, is an immutable personality flaw, something that is practically part of his biology. Dracula (Bela Lugosi) is plotting to put a fresh brain in Frankenstein’s Monster (Glenn Strange) in order to make him a compliant servant; Wilbur is being targeted as the donor because he has an “obedient” brain with “no will of his own, no fiendish intellect to oppose his master.” Chick acts more like a boss, ordering Wilbur around and trying to rein in his unruly behavior. Wilbur relies on Chick for physical protection, wailing his friend’s name whenever he’s frightened (of course, this results in the monsters removing themselves from the scene by the time Chick arrives). Dale’s and Wilbur’s love interests are essential to the plots of both films, and both involve them mooning over women who are intelligent and conventionally beautiful, but again we see the similarities end there. At the beginning of Tucker & Dale vs. Evil, the differences between Allison and Dale are highlighted. College students like Allison “grew up with vacation homes and guys like me fixing their toilets,” Dale argues early in movie, explaining why he won’t approach her. But just as Allison is convinced by her friends that Tucker and Dale are evil sadists because they look like villains from movies like Deliverance, Dale’s first impression of her is also a stereotype, and he discovers that she is a tomboy who grew up on a farm and likes bowling. Both Dale and Allison are the moral centers of their respective groups; Allison encourages her friends not to judge the locals of the rural area they’re camping in, while Tucker complains that Dale led them into a fiasco by being “a good Samaritan.” The growth of their relationship, as much as the string of mishaps and misconceptions that make the titular characters look like serial killers, are the film’s evidence against judging a book by its cover. The differing dynamics between friends is also reflected in how the thin friend reacts to their fat friend’s romantic inclinations. Chick repeatedly expresses skepticism that women like Joan and Sandra could be attracted to a guy like Wilbur, and tries to talk Wilbur into “sharing,” despite the fact that both women are disinterested in him. Tucker is occasionally frustrated that his friend chooses to woo Allison instead of help with renovations to their cabin, but ultimately he supports and encourages his friend. Chick and Wilbur find themselves the victims of an objective threat– Dracula, Frankenstein, and the Wolfman (Lon Chaney Jr.) are all very real in their world– while Tucker and Dale are largely threatened due to subjective interpretation: the college kids see a scenario they and the audience associate with horror films and map their ghoulish expectations onto it, fueled by Chad’s prejudice against hillbillies and forceful positioning of himself as an anti-hero. For much of Abbott & Costello Meet Frankenstein, Wilbur sees the monsters in their supernatural form and tries to convince skeptical Chick that they are real. Lawrence Talbot (aka the Wolfman) warns Chick and Wilbur of the oncoming supernatural threat, but Wilbur is the one who sees him first in his werewolf form. Wilbur also resists becoming part of Team Dracula, as he twice averts his gaze from a hypnotizing vampiric gaze and narrowly misses becoming part of the Monster when he is saved by Chick and Talbot. Dale, on the other hand, tries for much of the film to be seen as benign when he is misjudged as a threat, even going so far as to sit down for a mediated discussion over tea with Chad to hash out their differences. Eventually, though, he must conform to the college kids’ perception of him as a “psycho hillbilly” in order to save his friends and defeat Chad, who is the real source of danger to the other characters. Seen in conversation with each other, Abbott & Costello Meet Frankenstein and Tucker & Dale vs. Evil show a progression of attitudes with regards to their fat protagonists. Wilbur is static, as foolish at the end of the movie as he is in the beginning. His body is a marker of his personality traits, marking him as objectively unattractive and inherently less dignified than the other characters. At the beginning of Dale’s story, he perceives himself as the audience perceives Wilbur. However, Dale lives in a world where perception can be changed and corrected. His body and appearance never change, but he is able to change his persona through how he presents himself and how others see him, going from diffident fat friend to “killer hillbilly” warrior to romantic hero.